Last fall’s inaugural Symposium – which drew some of the most senior women sales executives in the advisory industry – was high energy from start to finish, and featured remarkably candid conversations and an active exchange of ideas and insights. And this year’s event will be even bigger and better. Attendance is limited to five representatives per firm. For more information, please contact MMI at events@mminst.org or (646) 868-8500. We hope to see you in Chicago! Hear from some of the industry’s leading sales executives as members of the MMI Women in Distribution Advisory Board share their perspectives on the greatest opportunities and challenges they’ve faced in the advisory solutions industry. In a series of rapid-fire “Ted Talk”-style presentations, these inspiring women will share their personal career journeys—their proudest achievements and biggest challenges, surprises and lessons along the path, tips on attaining a healthy work-life balance, and what they wish they had known earlier in their careers. In this candid discussion, hear what it takes to succeed as a woman in financial services. This session will share leadership lessons and practical advice on how women can define their own unique value proposition and take charge of their careers—and why it’s so important to give back and empower others. In today’s world, it is not enough to simply be good at what you do. Every person, especially those in wealth management, needs to build relationships and trust with clients, maximize their personal brand, and be their best authentic self in order to “seal the deal.” How does that happen? Through “presence” and communicating effectively in all relationships. However, we are not born knowing how to have “presence,” nor how to speak effectively, nor how to communicate clearly. These are learned skills. Learn how to hone existing skills and develop new communications skills. This session will be an informal, no-holds-barred conversation about how to win in distribution. Get ready for a frank discussion about the future of distribution and the specific challenges and opportunities for women in sales roles. Can you tell your life story in six words? Called “a luminary in the story world,” Larry Smith is an expert on personal storytelling and its value in building connections with people. His Six-Word Memoirs project, first launched in 2006, has become a global phenomenon with a bestselling series of books, board game, and live event series. A highly sought-after public speaker, Larry will share his insights on nailing your personal elevator pitch with succinct, authentic messaging. Presenting to a small group, especially in a boardroom setting, is unlike any other situation. It is part monologue, part dialogue, part presentation, and part improvisation. The dynamics are unique, and the stakes are high, so Invesco Consulting teamed up with word specialist and political consulting firm Maslansky + Partners to apply its unique instant dial-response technology to the language of the boardroom. Maslansky + Partners, well known for shifting public opinion with phrases like “Contract with America,” “death tax,” and “energy exploration,” tested boardroom language and strategies with over 100 focus group participants and in a 300-person survey. In this interactive workshop, attendees are shown preparation tactics, seating strategies, and presentation skills designed to help presenters win boardroom and other high stakes meetings. To equip you to better help your advisor clients take advantage of the ESG opportunity, Morningstar’s Trish Rothschild leads a panel discussion examining emerging themes in ESG investing and some of the persistent challenges that advisors face in having client conversations around this growing area. Our final session will focus on how firms are evolving and incorporating D&I within their organization as well as with partners and clients. The Symposium represents a unique opportunity to build brand awareness with female distribution executives, showcase your firm's offerings, and make new connections. 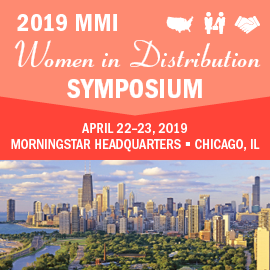 Investments & Wealth Institute® has accepted the 2019 Women in Distribution Symposium for 2.0 hours of CE credit towards the CIMA®, CPWA®, CIMC®, and RMA® certifications. The following hotels are suggested options near the Forum (located at 22 W. Washington St, Chicago, IL 60602). Important: ONLY current members of the MMI Center for Distribution Excellence are eligible for the first rate. If you are a member of the MMI Center for Distribution Excellence, please email cde@minst.org or call (646) 868-8500 to receive the registration discount code. All cancellations and transfers are subject to a $50 cancellation/transfer fee. Full refunds minus the $50 cancellation/transfer fee will be granted for cancellation requests received prior to 5:00 PM ET on Monday, April 15, 2019. After that time, no refunds or credits will be granted, however your registration can still be transferred to another individual at your firm. To cancel or transfer your registration, please notify MMI at (646) 868-8500.